IBM, a pioneer of the personal computer business, is selling its PC hardware division to China's number one computer maker Lenovo. After days of rumours, the announcement heralds a $1.75bn (£900m) deal which will make the combined operation the third biggest PC vendor in the world. Lenovo, formerly known as Legend, has been pushing hard to spread its brand on the international stage. IBM, meanwhile, will be free to focus on its other more lucrative businesses. The sale gives IBM $650m in cash, along with an 18.9% stake in Lenovo worth $600m. The Chinese firm will also take on about $500m in debt. Its PC business HQ will relocate from Beijing to upstate New York, where IBM is based, as a result of the deal. About 10,000 IBM staff will move to the new enterprise - about 2,300 in design, marketing and sales in the US and the rest in manufacturing in China. Among them is IBM senior vice president Stephen Ward, who will become the firm's chief executive. 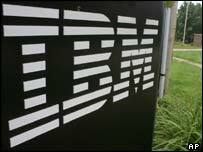 The merged firm will have sales of about $12bn a year, as well as a five-year licence for IBM's PC brands. "This acquisition will allow Chinese industry to make significant inroads on its path to globalisation," said Liu Chuanzhi, Lenovo's chairman. One Lenovo official told the BBC the deal was a dream come true and a matter of national pride. But the company's position is that it will not be satisfied with its number three position globally. Tuesday's announcement means IBM is backing out of direct involvement in a business that it turned into a mass market. 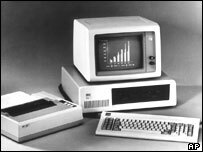 Back in 1981 the IBM PC hit the market: the first "personal computer" aimed squarely at businesses which - till then - had seen computers as massive central machines to be tapped into where necessary. The PC, in contrast, was designed to put processing power on the desktop. But copycat vendors moved in to sell their own "IBM-compatible" PCs, and the real money in the industry moved to software vendors - and in particular to Microsoft, the upstart company which had persuaded IBM to use its product to control the PC. IBM, in terms of market power the Microsoft of its day, failed to spot that hardware would become simply a commodity - a problem which has also hit other once-dominant vendors such as Hewlett-Packard. That shift has helped put Dell, which mastered the art of making PCs on wafer-thin margins, into the driving seat of the PC hardware business. It also made chipmaker Intel - whose semiconductors were for years the only irreplaceable piece of hardware in a PC - into a multi-billion dollar powerhouse. IBM today is much more focused on business services, chipmaking and selling high-powered servers and storage systems. In a way, the company has returned to its roots, selling the "big iron" which powers corporate networks. It has also learnt from its experience of repeatedly getting burnt by Microsoft. A significant proportion of its efforts now go into systems running Linux, the main open-source competitor to Microsoft's Windows.